Welcome to ExamNotes by CertBlaster! In this section we will look at virtualization. The ability to do more with less. Multiple tasks that once took multiple machines to perform can be done by one machine’s processing power. The process is called virtualization and can use two methods. You can have server side virtualization (Type 1), where all of the processing is handled by the server which delivers virtual environments or machines to each client. You will also see client side virtualization (Type 2) where the client desktops are virtualized into multiple machines. In both cases the virtual machines operate in their own isolated space as machines with operating systems installed on software that emulates physical hardware. Zero client – this is essentially a “dumb terminal” consisting of a keyboard, mouse, monitor and network interface and no operating system using complete server side virtualization. Thin client – this client does very little or no processing but does have enough resources to barely support an operating system and it relies on the server to do all of the processing. Thick / Fat client – this is a fully functional workstation PC or portable that is entirely self-sufficient and accesses the server only when necessary. Resource requirements for VMMs depend on the scale, number of virtual machines (or instances) to be deployed and the anticipated number of users, and the type of hypervisor being used (later) The VMM allocates a specified amount of Processor cores, memory and hard disk space to each virtual machine instance. There must be sufficient resources to support the host operating system, to the VMM and the VMs to be installed. Here is an example of a generous allotment of Processor and memory and disk space dedicated to a VM. Note the memory, remember the 64 bit Windows 8 version only requires 2 GB of memory. The additional processor memory and disk space will support more users. However when that VM is running the VMM reserves these resources. 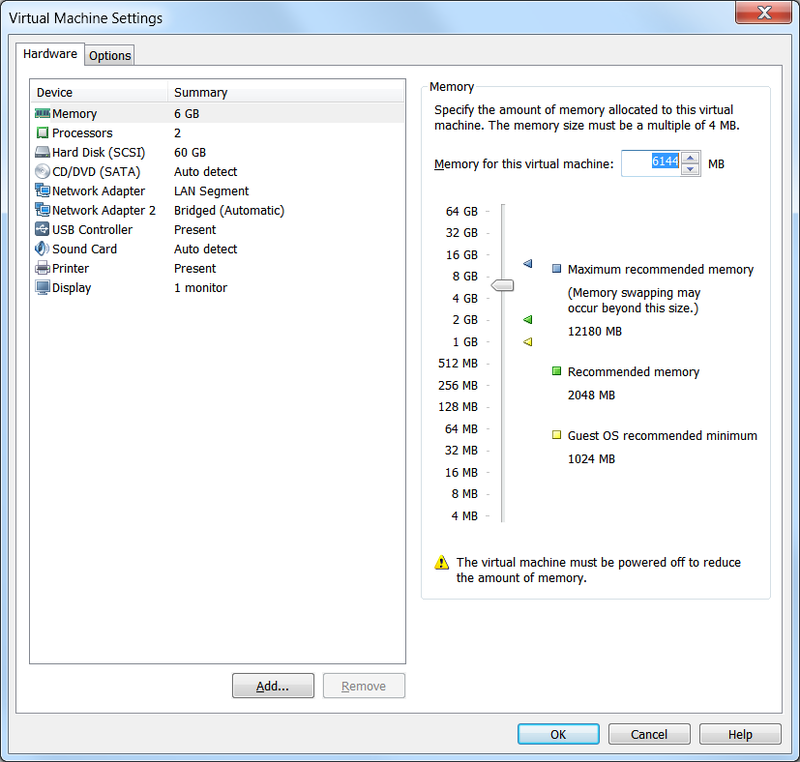 It controls the total amount of memory available for all VMs while leaving sufficient resources for the host. You should not run a VM below its system requirements or above an amount supportable by the host. Performance will suffer. This particular host has a 6 core processor and 16 GB memory with a host requirement of 2 GB and a 2 TB hard disk, plenty of room for a single instance. As you turn on each VM instance less power is available to the host. One thing is constant: The host system’s UFEI BIOS must support virtualization. Intel platforms use IntelVT and AMD platforms rely on AMD-V. Without these enhancements virtualization on the host will be impossible. 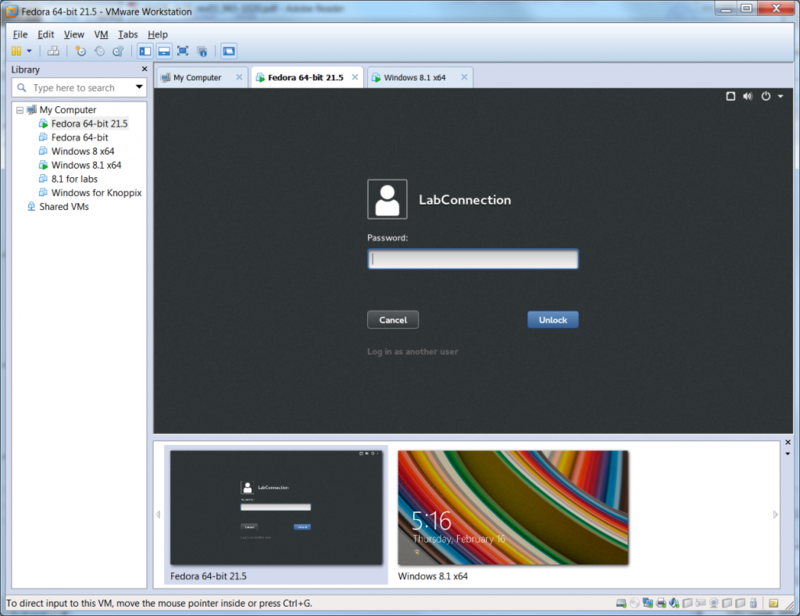 The Emulator (VMM) must have access to resources sufficient to cover the host OS and any resource allocations to the VMs. Here is that same VM running alongside a Linux installation that gas 2 GB assigned. So that’s 2 GB for the host. 2 GB for Linux and 6 GB for the Windows install for 10 GB memory usage. 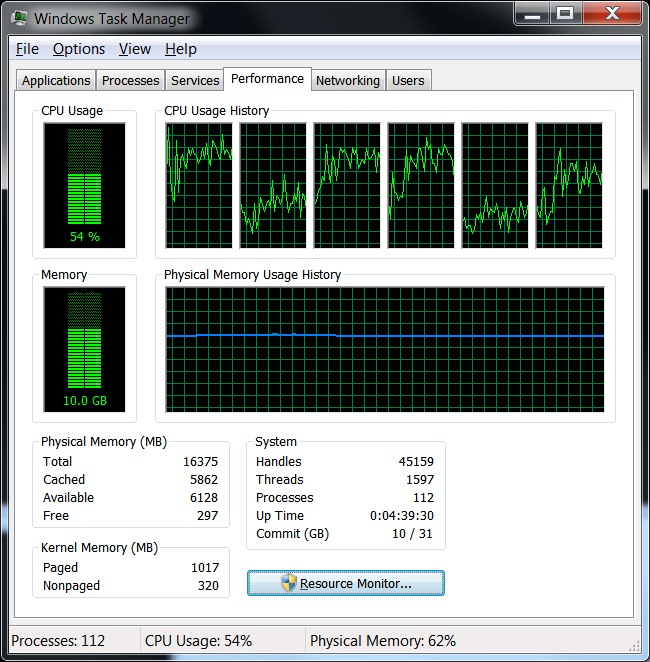 At rest with no VMM the machine uses roughly 30% of the Processor and 4.1 GB RAM. Security requirements are particularly important on VMs because new users tend to think the VMs are protected by the host antivirus/antimalware. This is not the case Remember the virtual machines are completely isolated from the host. Install the proper protection packages and also realize that as a “machine” separate software licensing applies in most cases. Read your agreement carefully. On a hosted VMM you cannot consume more network bandwidth than the host can support. Meaning that if you create instances of a Web server, an FTP server and a file server on a host machine and the VM instances experience high network traffic your total throughput is finite and allocated to the running VMs so the host PCs networking performance will fail, as will the VMs in a worst case. Hypervisor is another term to identify the Virtual Machine Manager. Hypervisors come in two types. Yes! That’s right! Type 1 and Type 2. A Type 1 hypervisor (Bare Metal) is installed on a clean machine with no operating system, typically a server class machine in a multi-server environment. This allows for more system resources to be dedicated to the VMs due to the nearly nonexistent overhead compared to a conventional operating system. Type 1 hypervisors require a Management Console installed on a different physical machine to remotely configure the hypervisor. The external control is required due to the lack of an operating system on the hardware. Type 1 hypervisor management consoles have the capability to dynamically allocate resources. This is most demonstrable in the case of RAM. If you have 16 GB of RAM installed the dynamic allocation could support multiple VMs configured with 16, 10, 8 and 4 GB of RAM respectively for a total of 38 GB. The memory resources are supplied to the VMs as needed, meaning that in most cases the total requirement of the VMs will not exceed16 GB and each machine will get what it needs at any particular time. If the memory capacity is exceeded the VM instance will be moved to a server that can support it seamlessly and imperceptibly to the user. A Type 2 hypervisor (Hosted) is dependent on a host systems operating system to operate. The exhibit shows a Type 2 hypervisor installed on a Windows machine running two VMs one Linux and a Windows instance. In the left pane you can see the library of available VMs. Most type 2 hypervisors allocate all of the resources allocated upon boot of each instance. So it is quite possible to crash the host OS by overallocating the resources. For example there are multiple instances of the same OS available and identically configured for testing. Were we to turn them all on at the same time the allocated resources would exceed the available resources and the Host would crash and the VMs with it. Be aware of the finite nature of your resources and how your hypervisor type will deliver them to the OS instances. That’s all for 220-902 Onjective 2.2. See you next time and if this is your time, good luck on the exam! You use the acronym “VMM”, but you never explain what it stands for. It stands for “Virtual Machine Manager”.